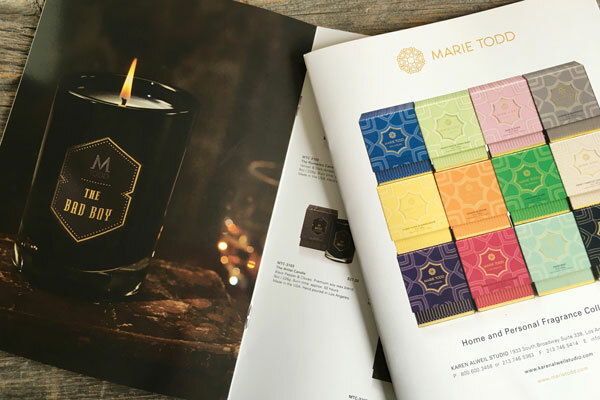 By 2013 Todd had expanded her product line to include luxury candles and fragrances, but realized her packaging wasn’t sophisticated enough to win over the well-heeled audience she wanted. And that’s when graphic design firm Prado Studio came up with a way to present the company and its products in a lavish light without losing sight of Todd’s original artistic flair. When Todd first approached the studio, sales weren’t as good as they could have been. Part of the problem was the packaging. When compared to other luxury brands, hers simply didn’t measure up. So how do you turn product packaging into a keepsake? The studio crafted traditional boxes wrapped with Neenah Paper’s CLASSIC Linen to create a sense of elegance and refinement. It was important to them to capture the complexity of the jewelry. Lisa Marie Todd knows a thing or two about packaging and reinvention. After graduating from the University of Santa Clara she pursued a career in Hollywood, landing on “In Living Color” in 1990 as one of the famed “Fly Girls” dancers for two seasons alongside Jennifer Lopez. But by 2009 she yearned to both do something creative and work with her hands, and so she began to make and sell jewelry under the company name Marie Todd.